Storsvenska riket av Arisk Nation, also known as Ko-Konungariket Sverige and Northern Europe or the Nordic Province, reaches from the shores of Northen germany to the cold mountains in the Northen part of Norway, The countried and Landscape Runescape joined together are Sweden, Norway, Denmark, Finland, Northen Poland, Iceland, Estland, Livonia, Ingria and Karelia. The Holy ontsby, the sanctuary for every Dodo on the planet is also located in Northen Europe but is independent from Northen Europe. The current Koungar of Storsvenska Riket are Radam Smetenskij and Lusk. Each Koung has a HAND of the King serving under him - Mickä Eastlund and Macht Löef, respectively. The anthem for Northern Europe is "Vikingablod" (Lusk), and "Rör inte vårat land" (Radam). 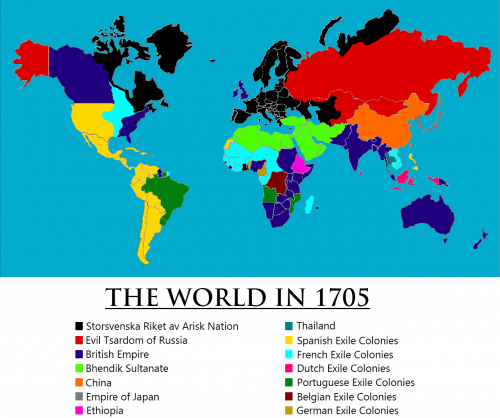 During the early days of Northen Europe there where no supreme ruler. During the rise of the Vikings there where one Murdering backstabing Liar called Lukanov(Viking name:Lusk) that started to unite all the vikings to become a big empire with the goal of controlling the entire world. Lusk, aided by his right hand Radam, started by taking full controll of Sweden, Denmark, Norway and Finland and renaming it to Storsvenska riket. Lusk sent out a couple of scouts to create maps and raid all over the world. The scout team where successful in their exploring and they found several locations, one of these locations where Vinland and the scout teams swiftly set up several towns and grew in strength at every place they found. Storsvenska rikets army of vikings lead by Mayor Bror spread fear all across the world but mainly in the European region. At Storsvenska rikets fought brutal and in huge number and some claim that they fought in RAGE. The Storsvenka rikes army where specialists in the tactic called "Not a single step back". Storsvenska rikets border grew extreamly fast and it didn't take long time before they toke controll of entire Europe. Storsvenska Riket at the height of its power. Storsvenska riket controlled the entire Europe but it was costly to maintain occupations of Europe but the leader Lusk didn't care about that he only wanted to expand Storsvenska rikets borders. The population of Europe where happy under the rule of Storsvenska riken since there were no more wars in Europe. The fall of Storsvenska riket started in France where Lusks loyal warriors and the entire france population started to act snobbish and think they where better than everyone else and they demand independence. The Revolution spred to every part of Europe except Northen europe. Lusk sent a mail to one of his generals in Germany called Adolpheus Hitler to immidetly attack the rebels. The highest priority were to stop the revolution the Poland and France and then crush all the minor revolutions in the other parts of Europe and after everything were under controll adolpeus should carry on expanding east. Adolpeus Hitler grew more and more angry for each passing day of the revolution. The entire German army were just standing and watching the entire Europe collaps into chaos. Adolpeus Hitlers anger drow him almost insane and he started to get strange ideas about mankind. Lusk who was furious of the loss of the full controll of Europe went back to Sweden stayed there watching his Empire fall apart. Adolpeus anger made him hate his leader Lusk but he still remained a loyal follower. Storsvenska riket had lost almost everything. Lusk went into a deep depresion of the loss of his Empire. He were always wondering why Adolpeus never attacked the rebels. One day when he sat in his castle in Kavaröbridgeway he were visited by a strange that told him that he was a russian and he would liberate the entire world but he needed Lusks help to crush the Tsar because he couldn't call in his Naval because they fighting wars in outer space. Lusk sent in his Honor guard to take care of the Tsar. The strange man sent a small troop of high tech soldier and the Tsar never stood a chance agains their combined strength. The strange revealed himself as Stalin and he were the Leader of a galactic civilisation called The Soviet Union. Lusk instantly pledged his loyalty to Stalin and The Soviet Union. Germany and the leader Adolpeus where still insane after the loss of Europe. He stumbeld upon a bunch of old mails and found the order sent by Lusk several hundred years ago. He instantly went out and ordered the entire country to produce Weapons and munition to stop the now Independent countries. Germany Swiftly crushed Poland and France. He crushed everyone else in Europe and continued to conquer more for the Storsvenska riket. His orders were to continue East and so he did, He started a war with The Soviet Union. When Lusk found out about this he ordered him to stop attacking. Adolpheus stated that he was just following the orders. Lusk told him to stop but Adolpheus Stated that he wasn't going to see the world being controlled and his viking brothers being suppresed and he proclaimed Storsvenska riker a traitor for the vikings and succeded from Storsvenska riket and founded Grossedeutchen Reich. The Soviet Union were shocked by this attack and they quickly resembled an army and crushed the germans at the battle of Stalingrad. Hitlers insanity had spread among the population and the majority where crazy. Soviet Union and Storsvenska Riket both sent in their combined force and stoped GrosseDeutchen Reich. Stalin showed the population the cure for their insanity. USAs greed made them make a all out war agains germany to take as much as possible when they germany were busy dying agains Soviet. Soviet and all their follower couldn't stand back and watch all these happening so they went to war agains the Capitalist and they pushing them back and finaly they manage to force them away from Europe. Lusk led the nation peacefully into the next millennium. However, after a dispute with HAND Radam Smetenskij in October 2012 he was assassinated and control of Storsvenska Riket passed to Radam. When Radam disappeared in March 2013, leadership passed to Prime Minister Fredrik Reinfeldt. In reality however, the de facto power went to Party member and leader of the opposition Stefan Löfven. When Lusk returned from the dead in April 2013, he reclaimed the title of Koung over Storsvenska Riket. In the Steam Trading Card Crisis however, Lusk was once again killed and Radam proclaimed himself Koung over Storsvenska Riket. After the Return of Lusk, both Radam and Lusk serve as Koungar of the Rike. This causes great confusion when Radam is ordering one thing and Lusk the opposite. But this has not made the Swedish people weaker, quite the contrary. The constant conflicting orders and the buraeucratic nightmare of having two all-powerful leaders have empowered the Swedes' Aryan genes, causing them to work 135% more efficiently. 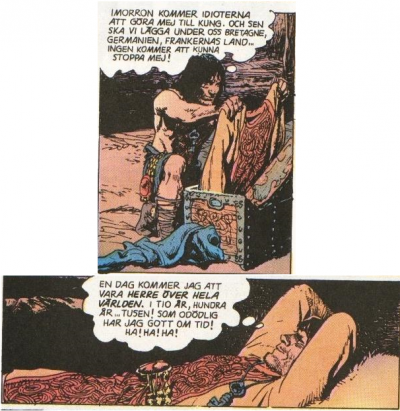 Many other cultural fenomenals has happen in Northen Europe like Gottsunda-heilen, which originates from the joke about Adolpheus Hitlers Insanity, Some people still think Adolpheus wasn't insane and that we should do what he was doing. One of the biggest and most famous Cultural fenomenal is trolling which was invented and mastered by the Northen Europe Leader Lusk and with help from a gnome from Ånö City. 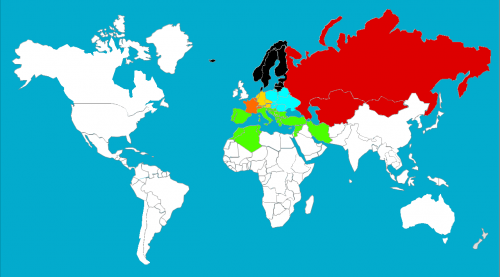 Northen Europe has an outstanding relation between Northwest Europe and of course The Soviet Union. Niko was officially pardoned after Radam became Koung. Sidan redigerades senast den 7 september 2015 kl. 22.37.